Do you have a junk room, a room that is rarely used because it is so disorganised. A room which is just used as a dumping ground? To be honest when I first became interested in minimalism I didn't really know where to start with decluttering. Although I had read two books about minimalism - Francine Jay's (Miss Minimalist) The Joy of Less and Leo Babatua's The Power of Less – the reality of sorting out my own clutter was not as simple as I read in books. The problem is cluttered rooms are not places you want to spend time in especially if the amount of clutter makes the room oppressive to be in. I found it easier to tackle small areas like editing my jewellery collection or my bedside drawer. I could devote an hour or less, go though each item in turn, weed out the excess and feel satisfied that I had completed a decluttering project. However, tackling a whole room at once was too onerous for me. Bigger areas of the house – the cluttered garage conversion/music room, our study/fourth bedroom and our garden sheds were so crammed with random clutter that I didn't know where to start. Streamlining these rooms seemed like an impossible task. But somehow I did declutter these particularly disorganized rooms. My approach to these rooms was to declutter them little by little over several months. Gather your decluttering tool kit together: bin bags, empty boxes, step ladder, cleaning cloths, and vacuum cleaner (if the room is not cleaned as often as the rest of the house). Set a time limit – probably no more than two hours. Have a general tidy-up and put away stray items in cupboards or drawers – if you can't get rid of all the clutter in one go you can at least keep it out of sight. Stack similar shaped items together, if they are spread about, to free up floor space. Remember you are trying to make the room more spacious. Try and work at a quick pace – don't get distracted by the sentimental value of certain items. Put items that you are unsure about losing to one side to consider later. You may have to consult other members of the family. Focus on decluttering just one small area of the room. In our garage conversion there were distinct areas and I would choose to work on one area at a time: a large cupboard, open shelves, a long desk/work surface and numerous boxes on the floor. Don't aim to completely declutter an area but aim to reduce the clutter by a certain amount, say half. Have a goal to eventually be able to turn the room into a pleasant and functional space. Finish your session by cleaning clear surfaces and vacuuming the room. Make sure that you show off your hard work to someone. I found that decluttering a very disordered space in bite sized chunks worked for me. I would feel good about my progress and feel motivated to return again for further decluttering sessions. As you get to know the clutter that lurks behind a room it gets easier each time you attempt to deal with it. So don't put off that junk room any longer. Have a little declutter session in there and see how you get on. You don't have to give up a whole day or a weekend just see what you can achieve in a couple of hours. 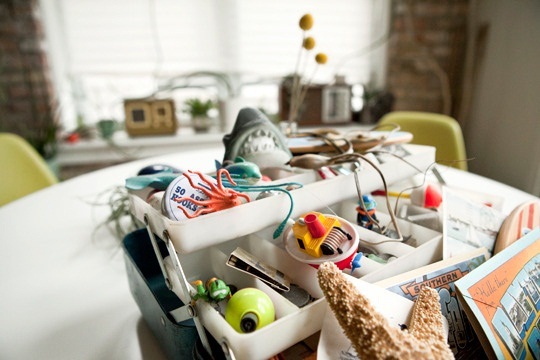 You can conquer the clutter little by little. I swear by FlyLady.net ! Flylady helped me to get my house sorted, it seems so obvious now but at the time it was just what I needed. I haven't visited the site for years but still use plenty of the ideas. Great tips, Claire! I agree - it can be overwhelming to contemplate decluttering an entire messy room. But one small space at a time is certainly doable! These are points worth sharing! Decluttering is obviously appealing to a lot, but the problem of figuring out where to start turns many people off. I agree with you that it’s best to start little by little, rather than going through the whole junk in one whole sweep. It’s less stressful and it keeps you motivated as you see your room becoming less and less cluttered.